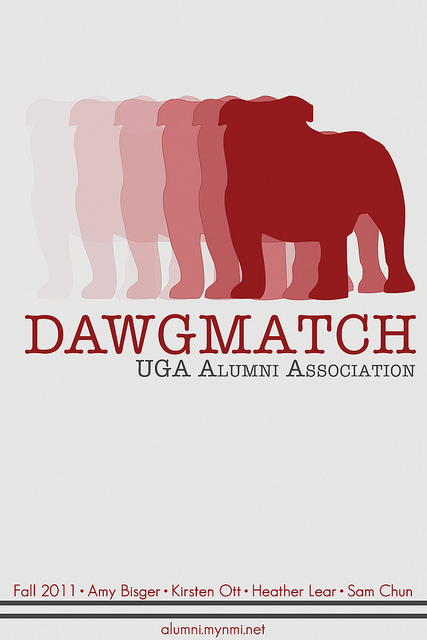 The purpose of DAWGMATCH is to create a Facebook application to connect UGA alumni in a more creative way than ever before. UGA alumni have ways to form professional connections on LinkedIn as well as ways to keep up with university news on the UGA Alumni website. However, what we at DAWGMATCH feel that the UGA alumni population lack is an online space to interact with one another that is purely social. The purpose of DAWGMATCH is to help UGA Alumni find other alumni with whom they are most compatible by comparing their interests and location. The beauty of DAWGMATCH is that users do not need to fill out a form about their interests or their location, because by using Facebook Open Graph technology, the app already has this information after the alum presses the “accept permissions” button on the DAWGMATCH “Like Gate.” This technology makes alumni interaction virtually effortless, because upon accepting the application’s permissions, alumni are presented with a circle of friends with whom they are most compatible, and from there they are encouraged to connect, or reconnect, with these classmates. Aside from the practical need for the social connection that DAWGMATCH provides, our team has a more personal reason for wanting to create this application. We feel lucky to have been assigned a client for this project with whom we already feel a connection. As seniors at UGA, we are already feeling nostalgia for our college years despite the fact that we are still college students. We are fortunate to be graduating from college during such a digitally innovative time where we will be able to keep in touch with our classmates easily through a variety of platforms. We are aware, however, that generations before than us have not always had these forms of technology at their fingertips, and this knowledge became a large source of inspiration for us while creating DAWGMATCH. As “Millennials,” we are connected to social media as part of our daily lives not only by choice but also as a requirement in our classes, jobs, and internships. Thanks to this exposure, using social media technology comes as easily to most of us as breathing. However, for many UGA Alumni even only ten years older than us, this is not the case. Our appreciation for older generations of UGA alumni inspired us to make our Facebook application as user-friendly as possible in hopes that alumni around the world can make digital connections with one another with a simple touch of a button. Alumni young and old can connect and communicate with ease using DAWGMATCH technology!